Details about Samsung's mysterious Galaxy O lineup first surfaced last month suggesting that the South Korean giant may release a duo of handsets with special virtual reality features. On Tuesday, one of the devices called Galaxy O5 has appeared on GFXBench's database, a site that conducts benchmark tests on mobile devices. The two handsets are said to be called Galaxy O5 and Galaxy O7, or Galaxy Grand On and Galaxy Mega On, respectively. Samsung has not shared anything official about them yet, but thanks to the leaked benchmark, users now know more about the former. The GFXBench benchmark listing was first spotted by a German tech site called WinFuture.de. The listing appears to be unavailable at the time of this writing but the said site has manage to take a screenshot of the specifications table (see below). It shows that the unannounced Galaxy O5 will pack a 5-inch screen with 1,280x720 resolution. The chipset powering the handset is listed as a 1.3GHz Exynos 3475 made by Samsung, paired with 1GB of RAM. The storage comes at only 8GB but it is likely that it will come with a microSD slot for expansion. At the back, the O5 will have an 8-megapixel camera with autofocus, LED flash, and full HD (1080p) video recording capability. It will also have a 5-megapixel front camera. Connectivity-wise, it will offer the usual features like Bluetooth, Wi-Fi, GPS with AGPS support, and NFC (Near Field Communication) support. The benchmarked specs did not include any mention of a dual-SIM slot, but if the model is launched in emerging markets, as previously speculated, then it is safe to assume that it will also have the said feature. 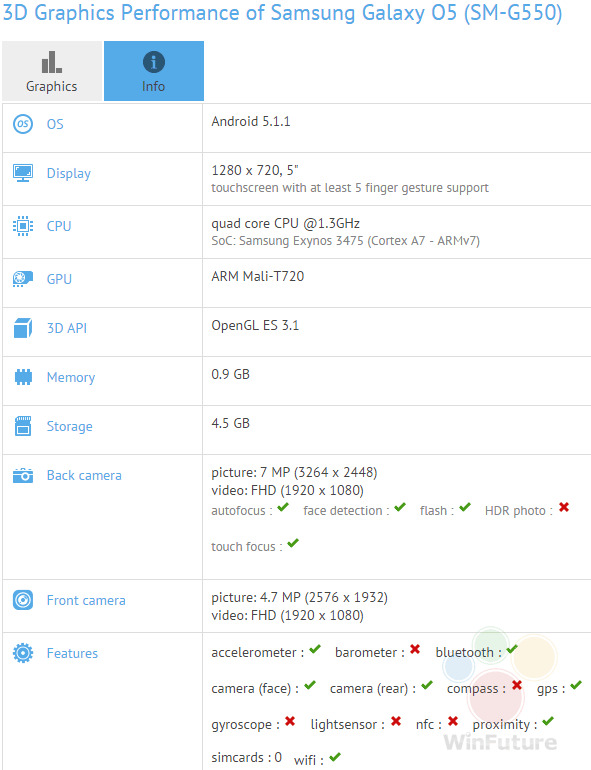 Meanwhile, the other handset called Samsung Galaxy O7 was benchmarked last month by AnTuTu, another benchmarking tool. It revealed that the device will have a 5.5-inch display and equipped by a Qualcomm Snapdragon 410. It means that there is a quad-core CPU coupled with an Adreno 306 GPU under the hood. It is supported by 1GB worth of RAM and a similar 8GB of internal storage. A 13MP main camera is furnished at the back, and a 5MP shooter in front. Both the Galaxy O5 and O7 reportedly runs Android 5.1.1 Lollipop OS. The existence of the device maker's Galaxy O series was first discovered by the Samsung-focused site called SamMobile.com. It reported that Samsung will launch two new devices with model numbers SM-G550 and SM-G600. The former will reportedly be the Galaxy O5 and the latter will be the larger Galaxy O7. It is worth noting that the tech giant's Galaxy O lineup is allegedly being developed in partnership with Oculus VR, the same American company that Samsung has partnered with co-create its virtual reality headset called Gear VR. Both the Galaxy O5 and O7 are expected to be unveiled during Oculus' Connect2 Developer Conference that will take place from September 23 to 25 in Hollywood, California.